Hello! 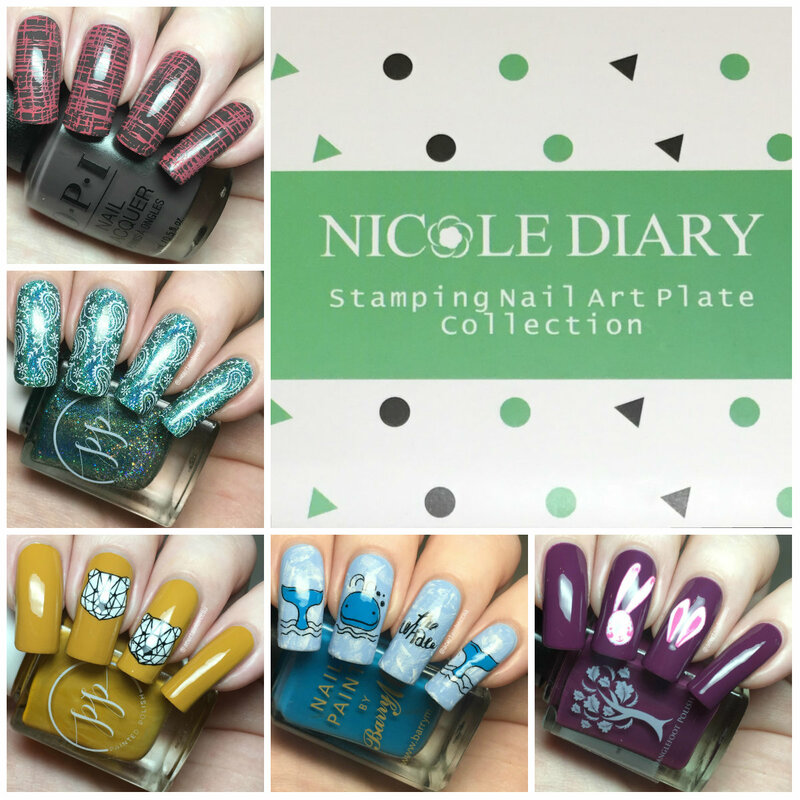 Today I have some stamping plates from Nicole Diary to share with you. The brand was kind enough to send me five of their stamping plates - two from Harunouta, and three from Nicole Diary themselves. All five are completely different in terms of theme and image sizes, so I'm going to show them all individually. 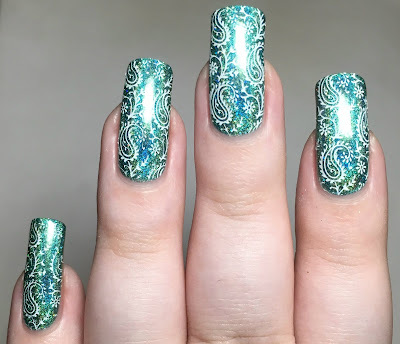 I've also created a nail art look with each one. Read on to see my manis and for more info! The Harunouta plates I recieved are L010 and L020. Both are the rectangular plates, one full of tartan and what I'd consider to be jumper patterns, and the other with various paisley designs. For L010, I settled on the textured pattern towards the bottom right of the plate. 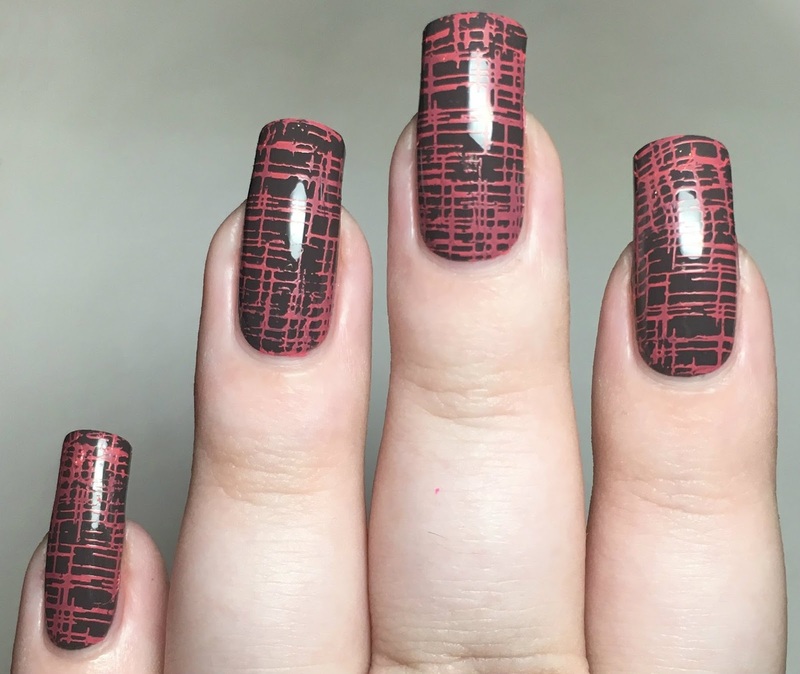 The square designs on this plate aren't quite long enough for nails, but thankfully they're very easy to extend with a quick second stamp. 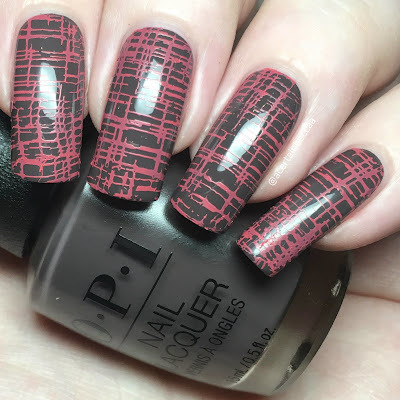 I stamped over OPI 'Krona-logical Order' using a pink stamping polish. For L020, I used the middle of the singular nail patterns. 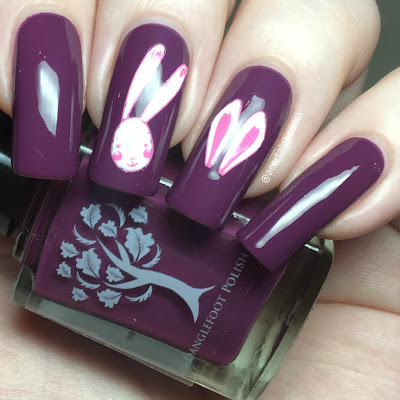 I kept it simple and stamped it onto each of my nails in white. 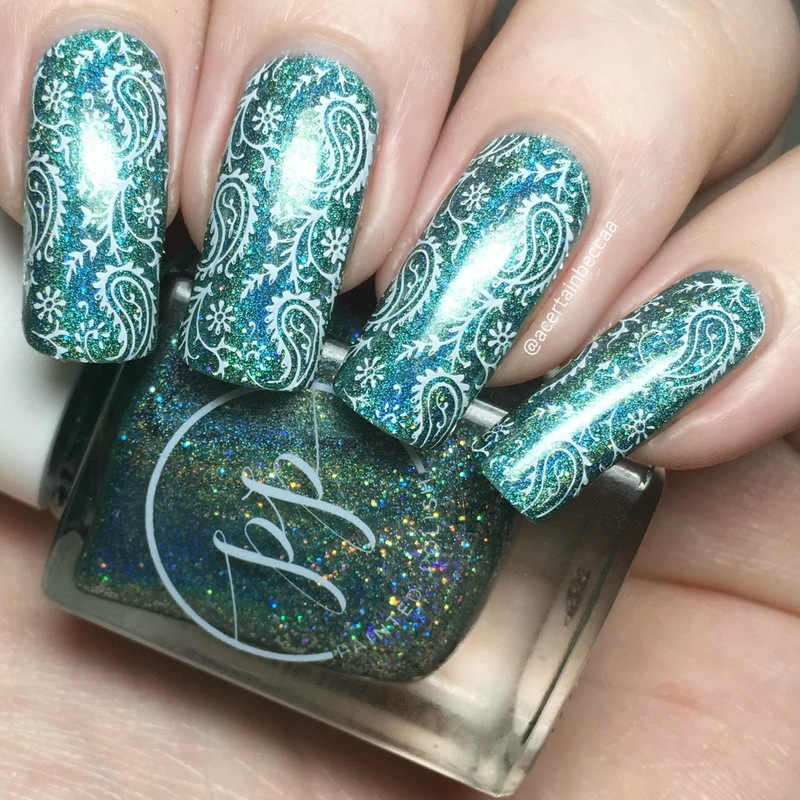 My base polish is Painted Polish 'Yo-Ho-Holo'. The three Nicole Diary plates I recieved are ND-025, a small circular plate, and ND-L003 and ND-L005, both rectangular plates. ND-025 is full of panda images, ND-L003 whales, and ND-L005 bunnies. For ND-025, the two origami type panda heads caught my eye. I used the softer of the two on the left and reversed stamped - stamping the outline in black before colouring the image in white. I added a panda head to both my middle and ring nails. 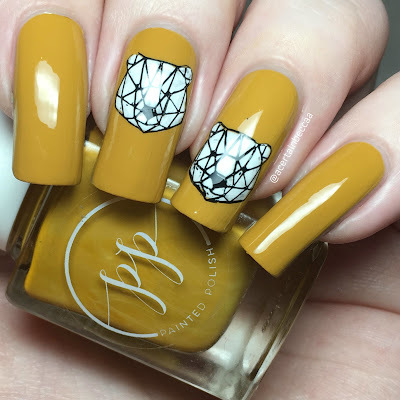 My base is Painted Polish 'Stamped in Mustard'. For ND-L003, I started off with base of Barry M 'Laguna', dry brushed with 'Matt White' to create a water effect. 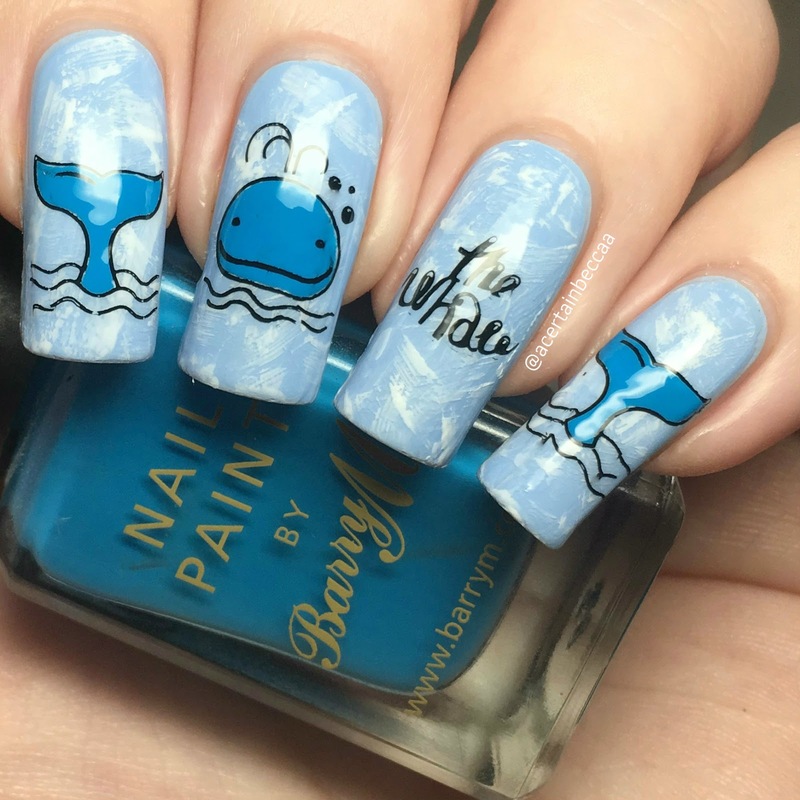 Using black, I stamped the wording 'The Whale' onto my ring finger. I then reverse stamped some of the whale images onto my other nails, using Barry M 'Cyan Blue' to colour them in. 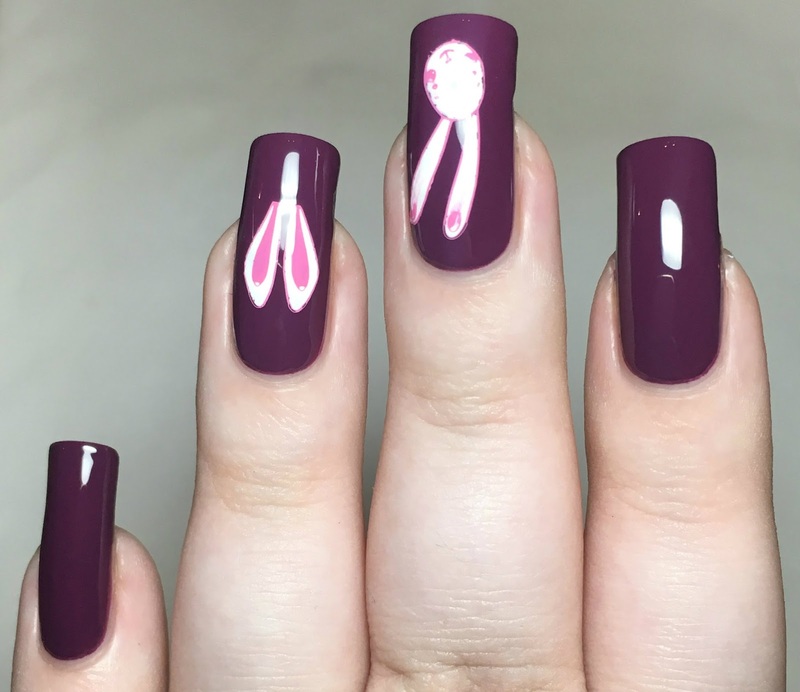 For ND-L005, I added a bunny head to my middle nail, and the straighter set of ears to my ring nail. I stamped using Esmaltes Da Kelly 'Kiki', and coloured the images in with white polish. My base polish is Danglefoot Nail Polish 'I Love You Always, Time is Nothing'. What do you think? I found the plates very easy to use, and had no issues with either picking up or transferring the patterns. There's such a variety of images across these five plates! From buffet images, to full nail patterns, to single images - there's something for everyone. All five plates mentioned, among others and lots of other nail art items, are available from the Nicole Diary Amazon page here.